Well, it was only a matter of time. After a sweeping origin story, a time-skip, some escapades in the wilderness, and a few training runs for our young hero, Tegami Bachi has decided to buckle down and get serious. Of course, that was already clear from the intensely revealing flashback in Volume 3—but now the drama surrounding the disappearance of Gauche Suede has been pushed into the present day, with Lag facing his greatest perils yet. Separated from his trusty traveling companion? Overpowered by Gaichuu? Face to face with mobs who consider Letter Bees enemies to be vanquished?! Hey, whatever happened to the nice heartwarming stories about delivering letters to people and making them happy? For those who still prefer the sweet, poignant side of Tegami Bachi, here's your last chance to enjoy it before the storyline takes that deep plunge. The early part of this volume is mostly episodic, with the first chapter telling the tale of a struggling son, his doting mother, and Lag learning that even misleading letters can be all right if one has good intentions. It's a weak, fluffy story, but one that at least leaves a pleasant aftertaste. For those who have more of a palate for humor, the second chapter is practically slapstick in nature, with Lag and his pals bumbling about as they try to figure out the eccentric, corpse-collecting scientist Thunderland Jr. It turns out he's a nice guy after all (aren't they always? ), but then Lag—or more correctly, Lag's special ability—dredges up the subject of Gauche Suede ... and you can say goodbye to these episodic, happy-go-lucky times. From the halfway point onward, this volume switches to full-on Search For Gauche mode, with all the attendant ups and downs. On the upside, the action and adventure reach new levels of excitement, as Lag's trek into the rebel town of Honey Waters is essentially his first mission without a safety net (no saccharine moral-lesson endings here), and another intriguing subplot emerges when Lag meets a townsperson who doesn't instantly want to kill him. The rebels' paranoid rantings also hint at a possible government conspiracy that is surely worth keeping in the back of one's mind. On the downside, however, Hiroyuki Asada seems to be consciously struggling to keep track of all the characters in the story arc, to the point where he has to "save" one of them by deus ex machina—or, more properly, dog ex machina. And if one can barely keep the good guys straight, what hope is there for the villains? These chapters try to gradually expose the antagonists' true motives, but the process is clumsy; it also doesn't help that the entire volume ends on a cliffhanger, thus guaranteeing plenty of unsatisfied readers waiting to see what becomes of this shootout. Not that the shootout lacks entertainment value. Asada's stylized, high-contrast art achieves new heights with all the fight scenes and chase sequences in the latter part of the book, and it's easy to spot the moments designed for maximum impact, like a Gaichuu roaring out of the ground or Lag's buddy Connor pulling off a sneak attack to disable the beast. But in trying to connect those pivotal moments, the artwork falters: transitional scenes tend to become drowned in all the bold lines and dark shadows, a problem that could be solved by using subtler shades of gray or a little more white space on the page. Even the characters themselves have a way of becoming their own obstacles to readability: sure, all of Amberground's inhabitants are creatively designed with retro-stylish gear and a touch of fantasy, but sometimes the elaborate outfits fill up the scene so much that they distract from the action. The only time the visuals seem truly under control is in quiet, contemplative views of the Amberground landscape—but those become hard to find once the heavy action sets in. Although the creator's personality comes out strongly in the artwork, the same can't be said of his writing style, which keeps putting the blandest lines in the main character's mouth. Now, perhaps this translation could have done a better job of giving some edge to Lag's vocabulary, but that's a tough order when he keeps spouting out generic nice-guy aphorisms about his sworn duty as a Letter Bee and how he'll find Gauche someday. Thank goodness for supporting characters, then, who at least have some attitude to them (although Niche can probably stop with the underwear jokes). Naturally, mad-scientist types like Thunderland are entertaining, but even the dark, moody ones like Zazie add spice to the dialogue. The edited sound effects, too, manage to fit into the series' visual "personality," with heavy, angular lettering that matches the artwork. Inquisitive readers will also appreciate the extensive notes in the back that add background information about the people, places and things that Lag encounters in Amberground. 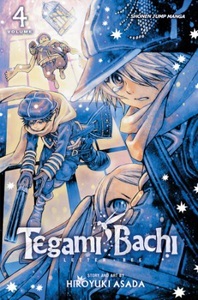 While Tegami Bachi has gained a sense of purpose (and peril) by having Lag go on a mission that relates to his ultimate goal, it also loses a little something by dropping the episodic tales of human nature and self-discovery. Is the trade-off worth it? It's hard to say yet, since this volume ends on a cliffhanger. Still, there are thrilling battles to be fought, as well as secondary-character subplots that could turn the tide in Lag's personal quest. On the flip side, however, Asada had better make sure not to get overwhelmed by having to draw every little detail or keep track of every single character—after all, he's got to keep it together long enough to tell us whether Lag ever finds Gauche or not. Here's hoping. + Main plotline takes a serious turn here, with plenty of action and mystery to keep readers interested along with unique, stylized artwork. − Drops the heartwarming, one-shot stories to focus on this new arc, and sometimes gets confusing with too many characters and visual details.